Home Cuba	Cycling Cuba: Look Ma, No Map! While the other tourists exited the airport and caught buses to the resorts, we unpacked our bikes. 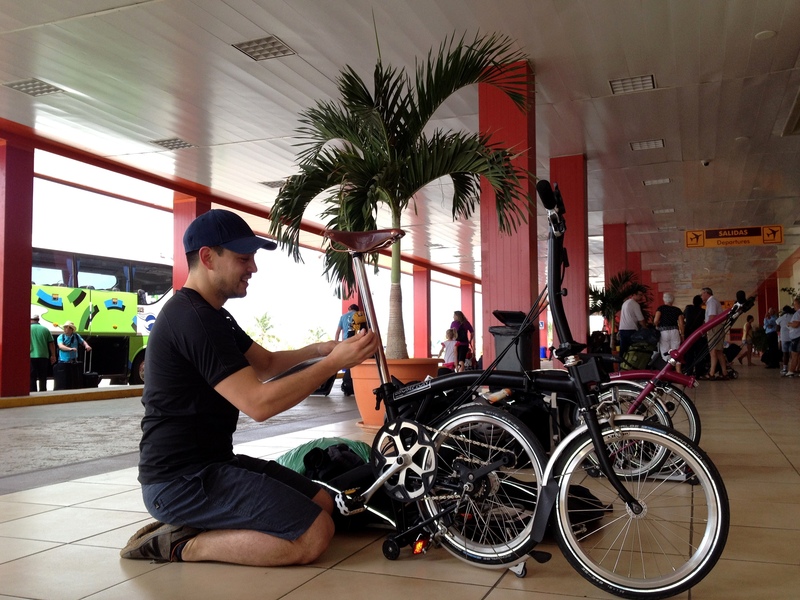 It didn’t take long to unfold the Bromptons, pump up the tires, and repack for riding. Maybe 15 minutes. And then, as was suggested in Bicycling Cuba, we went hunting for a detailed map. Apparently, road maps are not commonly sold in Cuba, so the authors recommended getting a map at the airport. This was also our first attempt to speak to Cubans and discovered something very fast – hardly any speak English. No one understood that we wanted a map. Finally, we made our way to the car rental office where the guys handed me… a not very detailed tourist map. That’s all they had. 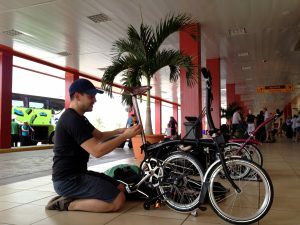 The Bicycling Cuba writers flew into Havana; maybe better maps are available there. 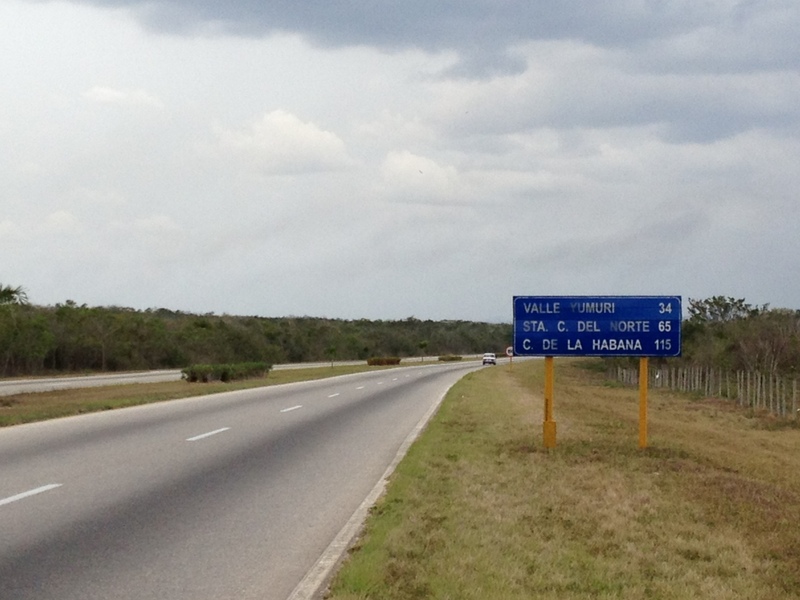 Luckily there’s only one road out of the Varadero airport. We couldn’t get lost yet. I wish I’d taken a picture of it; it’s one of the prettiest roads in Cuba! 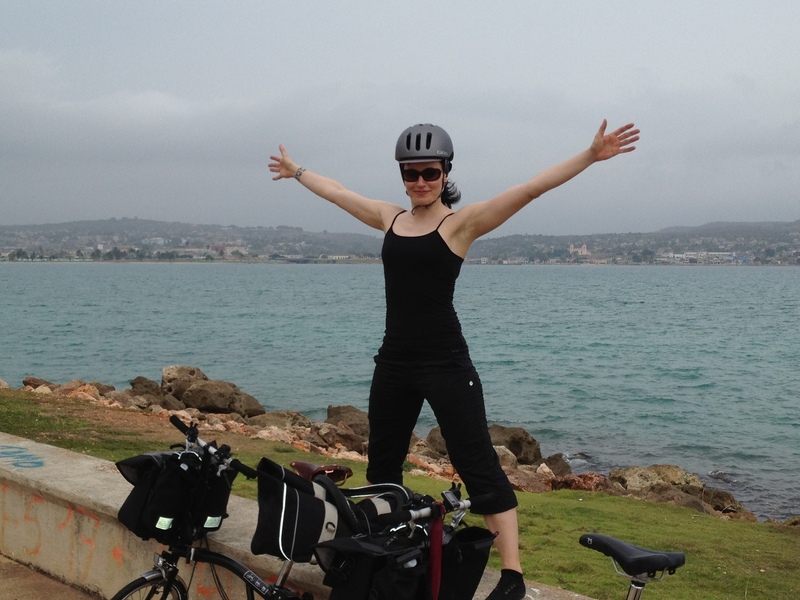 But we were too excited by the fact that we were BIKING OUT OF AN AIRPORT – oh the freedom! – to stop and take photos. Lined with palm trees, the airport road seems to say, “Welcome to the Caribbean!” And then… we turned onto the Via Blanca. Yep. It looks like a regular highway. Except, of course, for the lack of cars. That is the best thing about cycling in Cuba. The worst thing is that some vehicles still use leaded gasoline and the black smoke will choke you! If you are asthmatic and want to bike in Cuba, get a mask or cycle on quiet country roads. Because this picture is a bit misleading – usually we could see half a dozen cars at any given time. 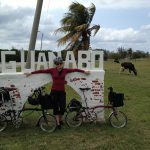 It’s certainly no 400-series highway, but the Via Blanca between Havana and Varadero was the busiest highway we cycled in Cuba. The speed limit is 100/km, the exhaust is horrific, but at least most of the motorists are courteous of cyclists and pass in the other lane. An hour later (around 20km) we arrived in Matanzas! 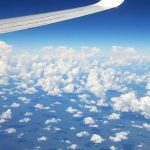 Q: Smog or clouds? A: Both. It was grey and cloudy, but that was probably a good thing for two Canadians coming from winter. Don’t want to get sunstroke on the first ride. I had a casa booked, the map to it saved on my iPhone, and we arrived just as the rain started pouring down. In the casa, there was a traveler from Winnipeg packing up his Bike Friday (another brand of foldable bike) into the bike’s hard suitcase. He was impressed by how small and easily our Bromptons fold. The Bike Fridays need to be disassembled a bit to make them fit in the suitcase, whereas our Bromptons condense into this neat tiny package, no disassembly required. Once it stopped raining, we wandered around Matanzas, but really, there’s not much to see. Except traffic. The city’s air is suffocating. It makes Toronto smog seem like a fresh country breeze. 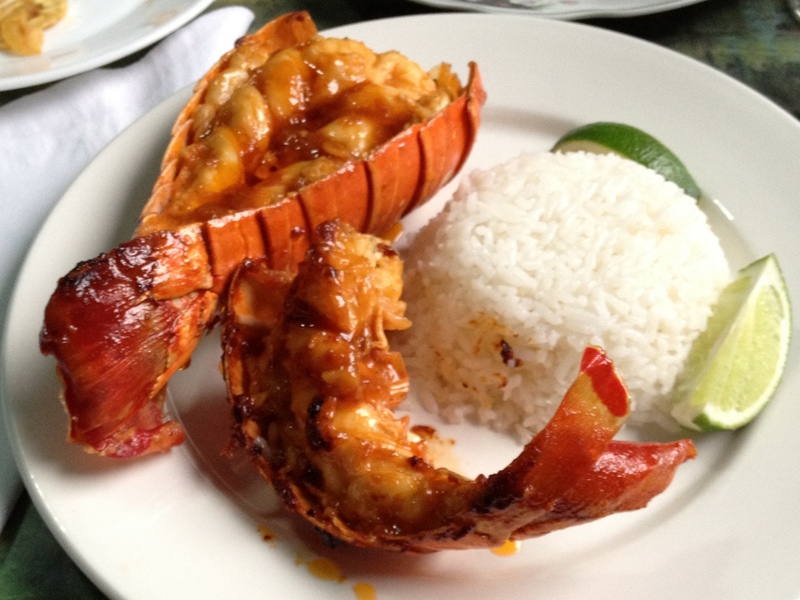 That night we ate lobster tail at our casa and chatted with the Winnipeggers (Glen & Carol). They were just finishing the exact trip we were embarking on – cycling from Matanzas to Havana to Vinales. They were flying out the next morning and gave us their leftover national pesos – a couple hundred CUPs! Sounds like a crazy amount, but they said in Canadian money it’s the equivalent of buying us a beer, so no worries. The national pesos are handy to have in small towns to buy food snacks. Otherwise, tourists pay for everything in convertible pesos (called CUCs for short) that are more-or-less equivalent to Canadian dollars. Since we were biking through some very tiny non-touristy villages, the national pesos came in handy.